Come create a personal tool for grounding, and connecting with the Earth energies of manifestation, growth, and nurturing abundance! More than your typical jewelry making class. This class takes on a creative journey to explore the power and majesty held within the element of Earth. Each participant will choose from Earth themed magical charms which hold symbolic messages of hope, support and healing. A guided meditation will allow us to explore the personal message that mother Earth and the Earth element hold for us. Aromatherapy will also be used to enhance our experience. With this knowledge as our guide, we will create bracelets using natural Earth themed beads such as Aventurine, Peridot, Ruby Zoisite, Malachite, and Unakite. 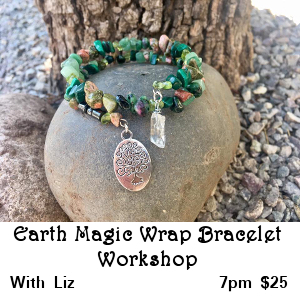 You will learn about the healing properties of these materials as you create, and your charms will be incorporated into the design. Your finished creation will be a beautiful reminder of your connection to the Earth. No jewelry making experience is needed and all materials will be provided.